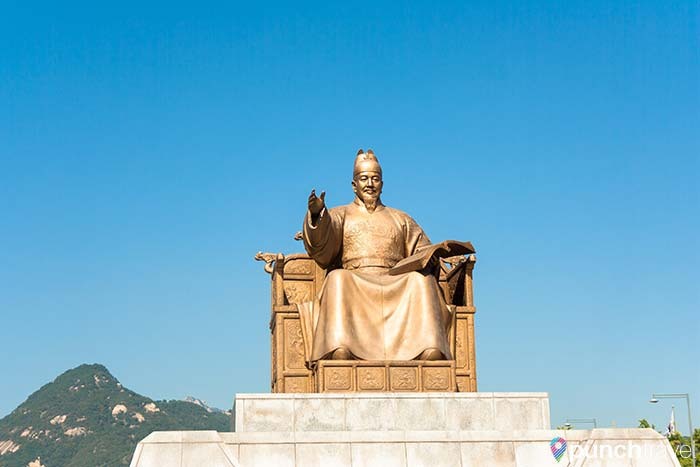 The capital of South Korea is a modern metropolitan city with over 600 years of history. It’s here in Seoul that Korean culture was born. The palaces and temples from the Joseon dynasty contrast with the skyscrapers and condominiums. Nestled in the middle of a mountain valley, the city is a myriad of cultural landmarks, department stores and markets, diverse cuisine, world-class museums, and idyllic greenspace. This often overlooked city is one of Asia’s best kept secrets. Follow our guide for the perfect weekend in Seoul, Korea. 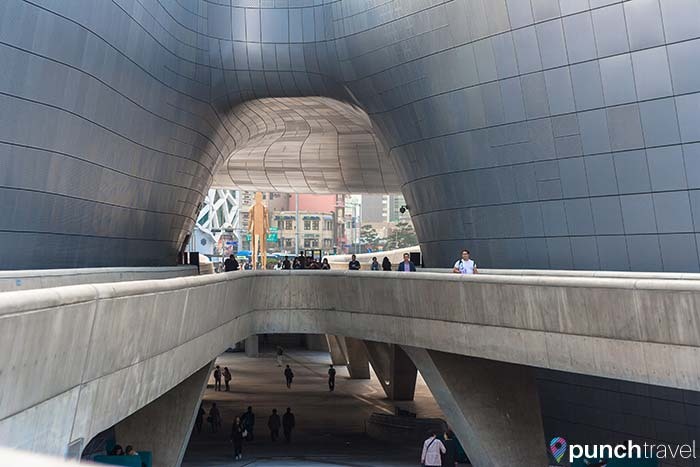 One of Seoul’s newest and most unique buildings is Dongdaemun Design Plaza (DDP). It’s a futuristic-looking building designed by world-renowned architect, Zaha Hadid. The writhing exterior is covered with over 40,000 aluminum panels like a giant robotic worm, inching its way through the city. The plaza is home to a design museum, boutique stores, and exhibition spaces. It’s a frequent host for some of Seoul’s top events, like Seoul Fashion Week in October. In the evenings, food trucks and live music take over its outdoor spaces. Across from DDP are several shopping malls offering a wide variety of fashion and accessories from local and global designers. 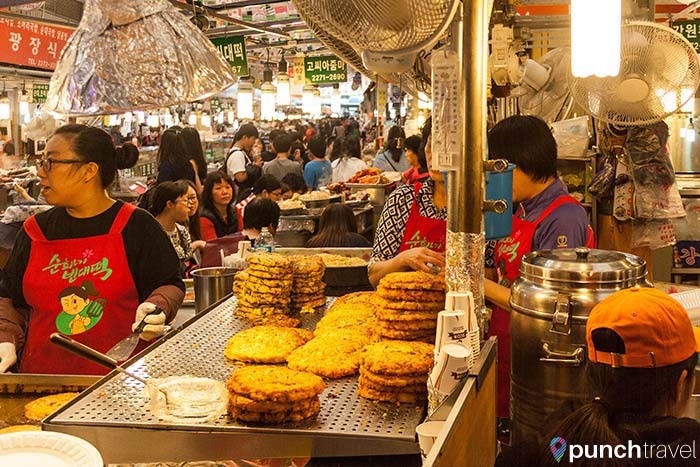 However if you’re looking for something more traditional, head to Gwangjang Market. A wholesale market with origins dating back to 1905, this is the place to go to buy fabric and hanboks, the traditional Korean dress. It also has a popular Eatery Alley, where you can savor some of Korea’s best street food, like gimbap (rice and pickled vegetables wrapped in seaweed) or bindaetteok (mung bean pancake). Seoul has a coffee culture that rivals Seattle’s, and I would know! On every street corner you’ll find no shortage of coffee shops. Everything from global chains like Starbucks and The Coffee Bean & Tea Leaf to local hipster cafes offer coffee any way you like it. For some brunch with your coffee, head over to Cafe Burano in Hongdae, the center of youth culture in Seoul. In addition to the usual breakfast fare, they also serve a fine selection of burgers, including a beet burger to satisfy any vegetarian. 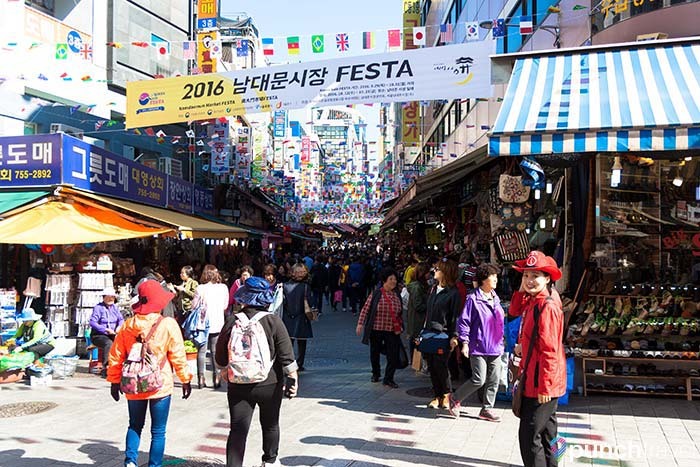 On Saturdays, Hongdae’s Hongik Children’s Park hosts a local flea market. 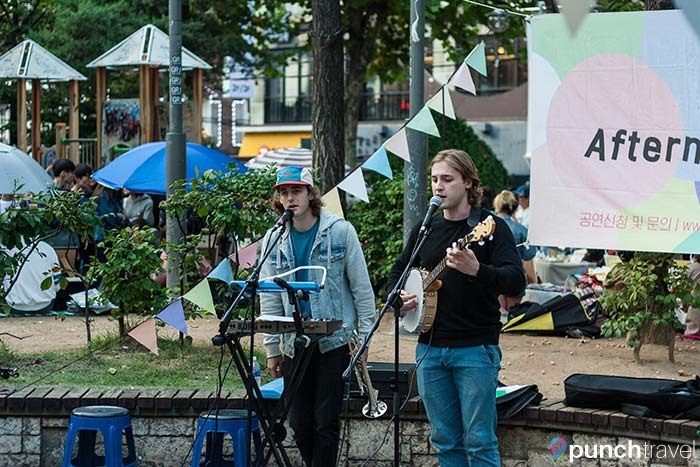 An open mic in the corner of the park attracts local musicians and expats to play. If you’re looking for inexpensive clothing and accessories, you can find it here. Check out aA Design Museum, for its museum, cafe and gift shop with trendy picks. Namdaemun Market is the largest market in Korea, selling clothes, shoes, household items and of course, food. There are three food alleys in the market specializing in fish soup, chopped cold noodles and traditional Korean fare. 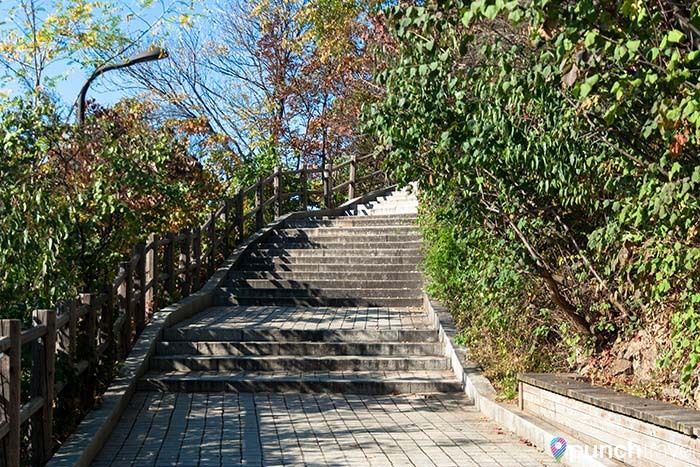 Now that you are fueled up, follow the Seoul City Wall towards Namsan Park. 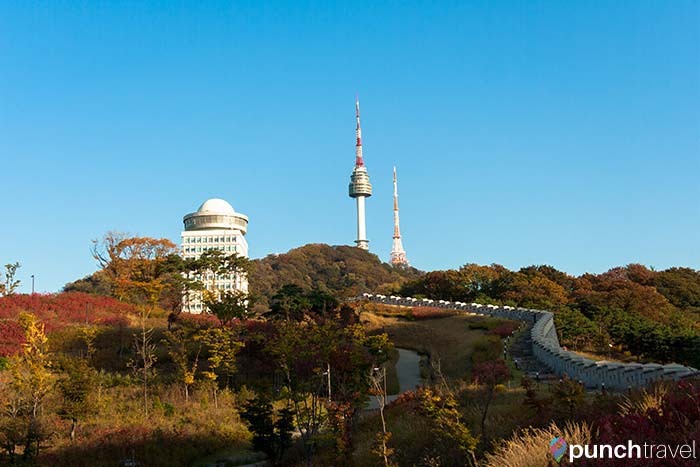 The park is home to many popular tourist attractions, including the N Seoul Tower. 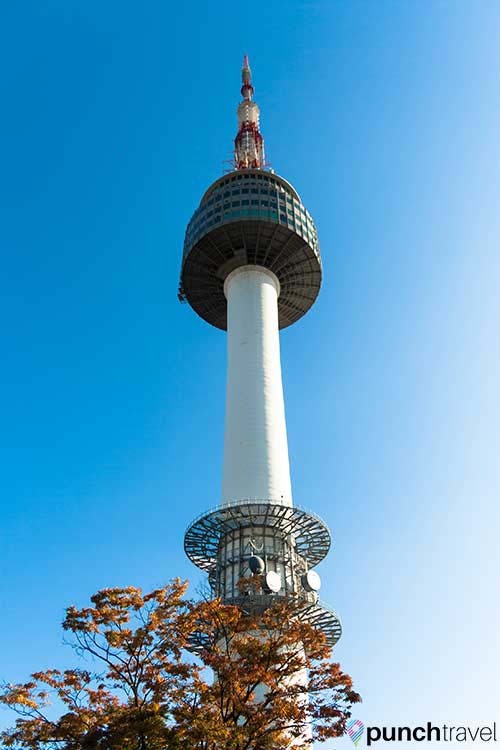 Seoul does not have many iconic buildings like its neighbors Tokyo or Taiwan, but it does have the N Seoul Tower. At 236.7 meters tall, it’s a popular place to visit for 360 degree views of the city. A cable car takes you to the top, but you can also make the 1300 meter ascent along the wall like they did in the past. Near the top, four beacons remain from when the hill was used as a way to warn people about imminent enemy attacks. The tower has several restaurants, cafes, and shops, in addition to the observation deck (₩ 10,000). However you don’t need to visit the observation deck to get a good view. 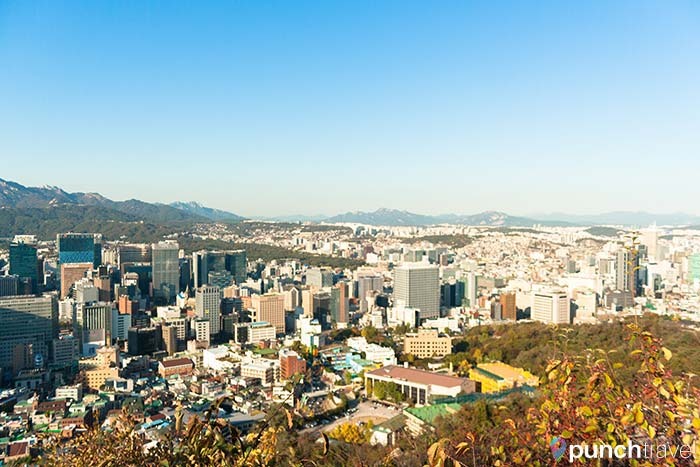 The platform at the base of the tower provides unobstructed views of Seoul in all directions. 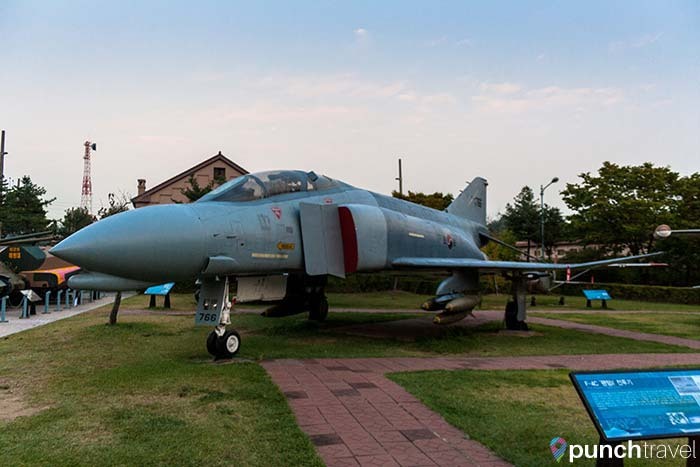 Korea has a long history of conflict with its neighbors and the War Memorial Museum is the best place to learn about it. 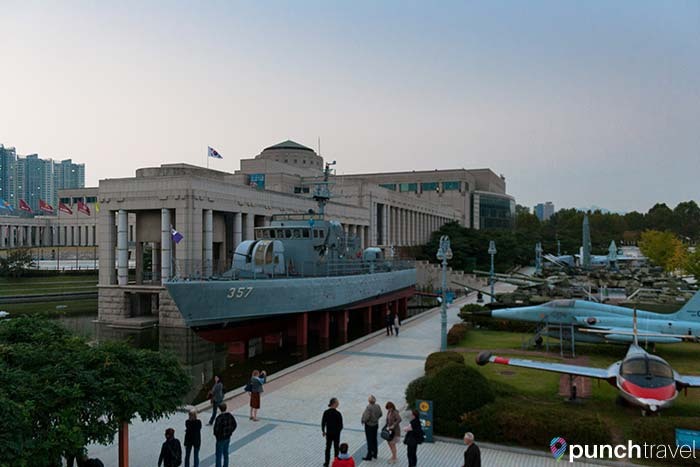 The museum is fittingly located across from Korea’s Ministry of Defense. As you approach the museum, the sheer magnitude of the building commands attention. Huge monuments surround the museum and the entrance is encircled with flags representing the countries that supported South Korea during the Korean War. 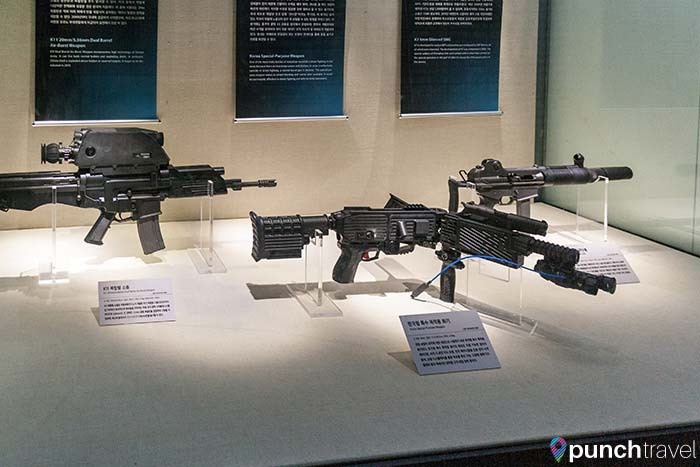 You’ll need a few hours to see everything, and don’t miss the fighter jets, helicopters, submarines and tanks outside. Head to the neighborhood of Itaewon for a night out. The area is a dizzying array of restaurants and bars representing cuisines from cultures around the world. It’s also Seoul’s biggest expat neighborhood, and you’re likely to see many off-duty military personnel from the US military base across the street. The dining possibilities are endless but a few standouts include the cheese-filled patty Juicy Lucy burger at Left Coast Artisan Burgers and the Galbi short rib tacos at Vatos Urban Tacos. However, if you’re a Korean barbecue newbie, dash over to Maple Leaf. The trendy restaurant is decorated with recycled Heineken bottles and birch trees. The staff will assist you with the grill to ensure that you enjoy a perfectly-cooked piece of meat. Myeong-dong Street is Korea’s best-known shopping district. The narrow streets are filled with shops selling cosmetics,apparel and accessories. There’s even a gift shop for the popular Asian mobile messaging app, Line, complete with a giant character out front. 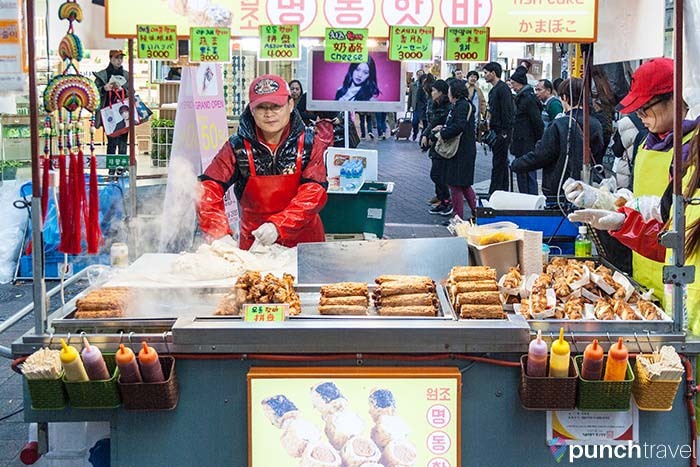 In addition to shopping, Myeong-dong street is the place to try different types of street food. You can sample fish cakes (pictured above), grilled eel, cotton candy, strawberry mochi, kebabs and my favorite, tornado potato. 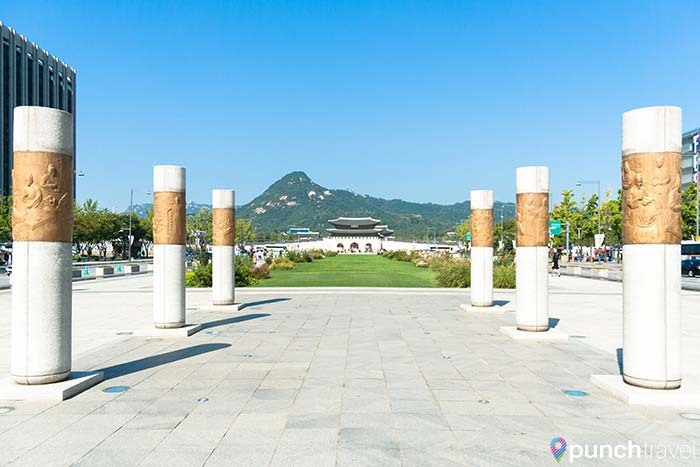 Gwanghwamun Square is a plaza marked by a commanding statue of King Sejong and is frequently used for events. 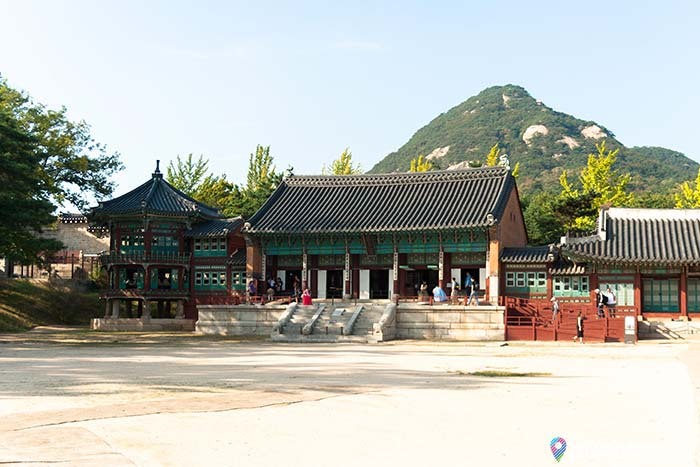 Walk along the wide expanse toward the Gwanghwamun Gate of Gyeongbokgung Palace. 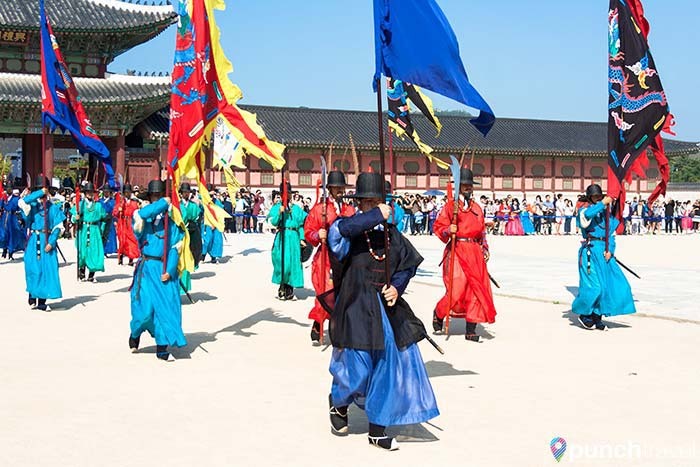 The palace is the first and largest of the five palaces built during the Joseon dynasty. The brightly colored buildings are set against the backdrop of the majestic Bukhansan Mountains. The compound was used as a royal residence as well as a place to conduct royal affairs. The style of the buildings and garden grounds reflect ancient Chinese architectural design and the aesthetics of the Joseon Dynasty tradition. A popular changing of the guard ceremony occurs twice a day. 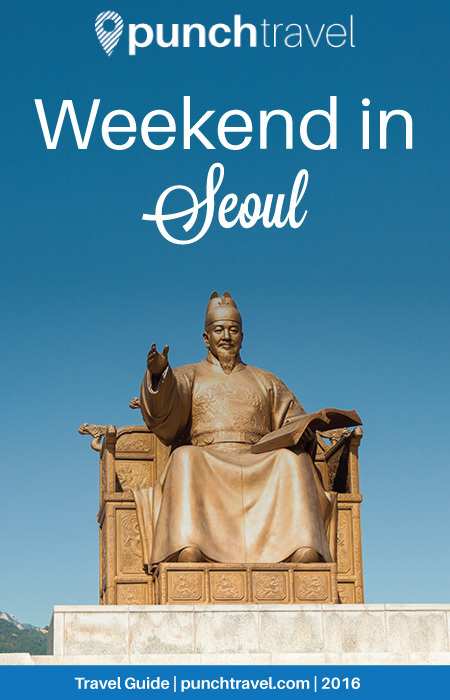 What does your perfect weekend in Seoul look like? Let us know in the comments!